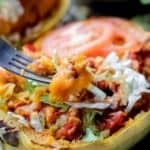 All the cheeseburger flavor and fixings packed inside a healthy spaghetti squash boat. These boats are so incredibly filling and super easy to make! Cook the squash: Preheat the oven to 375 degrees. Cut each spaghetti squash in half lengthwise. Scoop out the seeds. Rub olive oil over each half and sprinkle with salt and pepper. Place the squash halves flesh-side down a baking sheet and roast for 25-35 minutes until al dente. Let the squash cool. Once cooled, scrape the spaghetti squash from the sides, leaving a pile of loose strands in the middle of each boat. Brown the meat: While the squash is cooking, prepare the cheeseburger filling. Add the olive oil to an extra large pan over medium heat. Once heated, add in the onions and 1/4 teaspoon salt. Sauté the onions until soft and translucent. Add in the garlic and cook another minute. Add in the ground turkey and cook until browned. Stir in the diced tomatoes, tomato sauce, tomato paste, and pickles. Evenly divide the cheeseburger filling among all 4 halves. Top each boat with 1/4 cup cheese. Return the boats to the oven for 5-10 minutes until the cheese is melted. Top the boats: Once out of the oven top with fresh tomatoes, shredded lettuce, chopped onion, and more chopped pickles if desired. Cooking times for the squash will vary based on the size of your squash. I recommend checking the squash at the 25 minute mark. If the strands are still quite firm, put back in the oven for an additional 5-10 minutes. You want the strands to easily pull away from the sides, but they shouldn’t be mushy.